I usually feel the urge to bake yeasted breads when there is no time at all for that – go figure. And this time, to make things even more difficult I felt like baking a very specific type of bread: I wanted it to look good (I’m a complicated human being, my friends, I’ll admit to that). There was an amazing recipe using bananas in one of my current favorite cookbooks , but I would not have the time to defrost the bananas in my freezer. That was when I remembered Tessa Kiros’ gorgeous buns , and to make things even better they were filled with a butter, cinnamon and sugar combo, a.k.a. “the irresistible combo”. Don’t the buns look beautiful? And I can guarantee you that they might look difficult to shape, but they’re not. Put the milk, sugar and yeast in the large bowl of a stand mixer and whisk with a fork. Let stand for 5-7 minutes, or until the yeast begins to activate. Add the egg, butter, cardamom, and salt and mix in low speed with the hook attachment. Gradually add the flour, then mix until smooth and elastic, 5-7 minutes – you can knead by hand if you wish. Transfer the dough to a lightly oiled large bowl, cover with plastic wrap and a clean kitchen towel and leave in a warm place for about 2 hours, or until it has doubled in size. 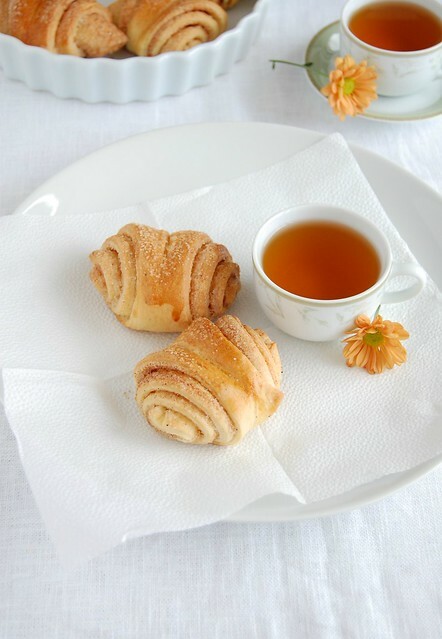 Cinnamon butter: in a small bowl, mix together the cinnamon and sugar. Divide the butter into four portions and set aside. Put the dough on a floured work surface and divide it into four portions. Begin with one portion, covering the others with the kitchen towel so they don’t dry out. Using a rolling pin, roll out a rectangle, roughly about 30x25cm (12x10in) and 3mm (1/8in) thick. Evenly spread one portion of butter over the surface of the dough with a spatula or blunt knife. Sprinkle with ¼ of the cinnamon mixture. Roll up to make a long dough sausage. Set aside while you finish rolling out and buttering the rest of the dough, so that you can cut them all together. Line two large baking sheets with parchment paper. Line up the dough sausages in front of you and cut them slightly on the diagonal, alternating up and down, so that the slices are fat V shapes, with the point of the V about 2cm (¾in) and the base about 5cm (2in). Turn them so they are all the right way up, sitting on their fatter bases. Press down on the center of each one with two fingers, until you think you will almost go through to your work surface. Along the sides you will see the cinnamon stripes oozing outward. Put the buns on the baking sheet, 5cm (2in) apart. Brush lightly with beaten egg and sprinkle a little sugar over the top. Let the buns rise for 30 minutes – in the meantime, preheat the oven to 180/C/350°F. Bake them for 20-25 minutes, or until they are golden. Check that they are lightly golden underneath as well before you take them out of the oven. Serve hot, warm, or at room temperature and, when they are cool, keep them in an airtight container so they don’t harden. Oh my! These look fantastic! I think I need to get this book... Great brunch recipe! This is a recipe that will be fun to make. So, I'm gonna give it a try within the next few days. Yum! I love cardamon and I love cinnamon so this sounds heavenly! Thanks! Ooh I love cardamom. Will definitely try these for a brunch I'm hosting this weekend - thanks! These look so light and delicious and love that they have cinnamon! These are gorgeous - wish I was eating one right now! I've never used cardamon in my rolls. I can't wait to try it out! These look so good! Thank you for sharing! I understand you completely. Sometimes I do things when I have no time for them, and I'm all about making food look good. The buns look sublime! And I love the idea of the cinnamon-cardamom combination.